This is basically a "reprint" of my guest blogging post from a while ago. Many of you may have seen it here on Dollar Store Crafts. Hand-me-downs and Goodwill half-off finds are a way of life at our house. With three small kids and hubby just out of graduate school, we're always pinching our pennies. We've been blessed with a lot of wonderful, generous hand-me-downs at just the right times...but the pieces we're given don't necessarily match. While our 5-year-old doesn't feel the need to dress-up quite as much as Fancy Nancy, she does love to wear clothes with fun designs on them. Our 2-year-old doesn't care all that much about what he wears...but it is easier to get him to change into clean clothes when there's a fun dinosaur instead of just a plain red shirt. So I'm here to share some of my tricks for using homemade appliques to make coordinating outfits out of mismatched hand-me-downs for next to nothing. Appliques are great because they can be added to virtually any piece of clothing and can help cover up stains or holes and make clothes look like better than new. 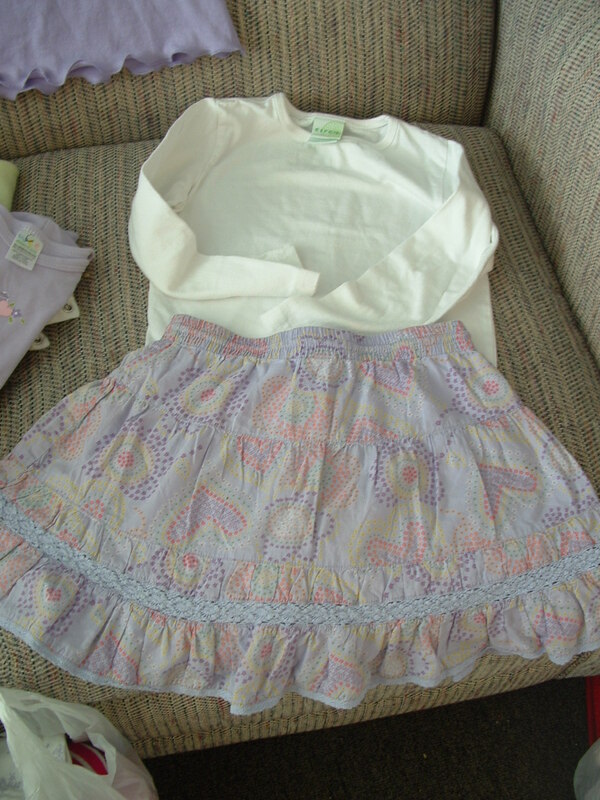 Clothes to decorate, Heat'n Bond Lite (or there are "no sew" versions you can use), scraps for applique, Fray Check is optional depending on the fabric you choose to use and the look you want, basic sewing gear (needles, thread, sewing machine helpful, but not essential. Almost any type of fabric can be used for appliques. I used woven cotton fabric for years with great success using a satin stitch edging. 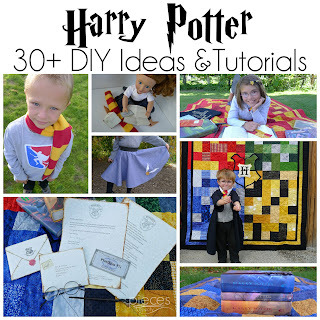 Recently, I tried using knits from old T-shirts and have fallen in love with them because they are so much less prone to fraying there are more possibilities for them. 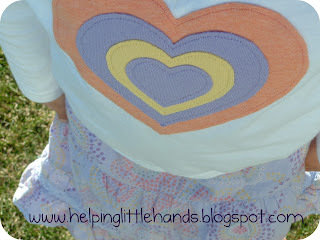 If you've never done applique's before, I suggest starting with knits. 1. Take a look at what you have. I like to collect all the "mismatched" clothes in one place, so I can pair them up. Be flexible and think a little outside the box about what pieces could go together. For this project, I started with these. Since the shirt is white, they can "match" on their own, but Firecracker isn't thrilled about the plain white shirt. 2. Choose a motif. 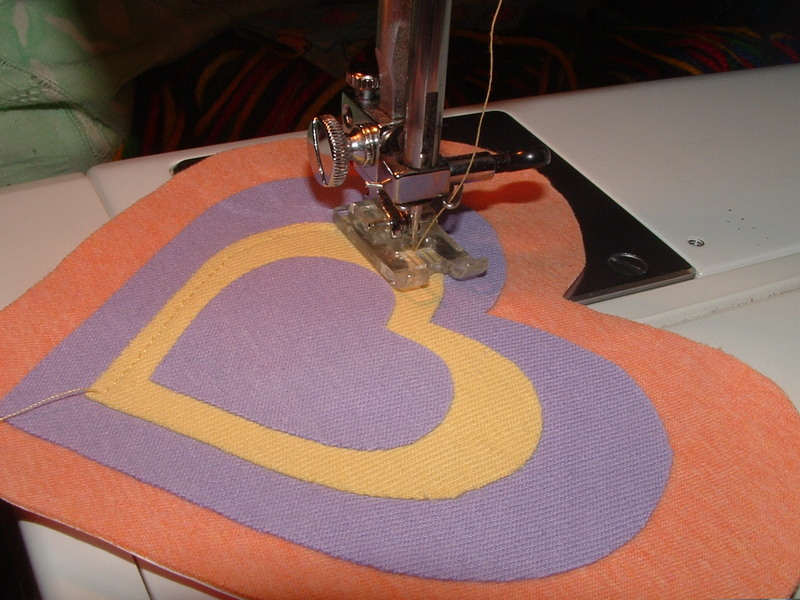 If one of your pieces has a pattern, see if there's a way to turn that into an applique. 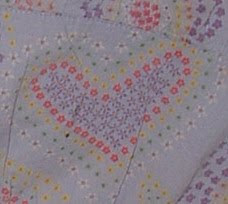 In this case, the skirt had a design with layered hearts and flowers. I decided to use the hearts because it was an easy pattern to copy. If there is no obvious motif, then choose one and use a common fabric to applique onto both the shirt and pants/skirt to bring the outfit together. 4. Choose your look. There are a lot of ways to applique. The two main ones I use are satin stitch or a straight stitch. With a straight stitch your edges will fray a little after multiple washings, but is great for knits since they don't fray. Satin stitch will seal in your edges, so that most fabrics will not fray at all, but it can be a bit trickier to get the stitching to be even. I used regular straight stitching for this project, but if you want more information and examples of satin stitching, you can see my post here. 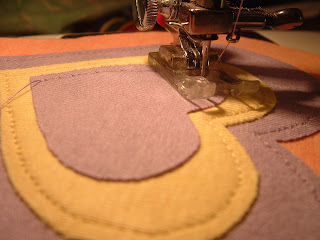 If you don't like to sew or don't have a sewing machine available, you could also sew the edges by hand. 5. Make your applique! Now we're to my favorite part. 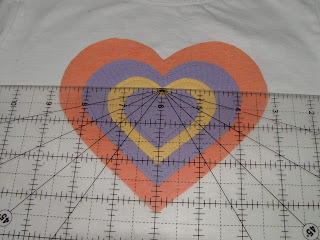 Trace your pattern onto the papery side of some Heat'n Bond Lite. (There are other products out there that will work for this...but this the one I'm most familiar with.) Keep in mind that your design will up reversed (a mirror image of) your original design. For this heart and a lot of other patterns it won't matter. It definitely matters if you're doing letters though, so be careful. 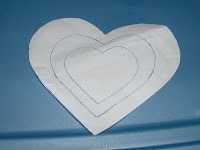 I traced the biggest heart by itself and then traced the three smaller hearts one on top of the other. 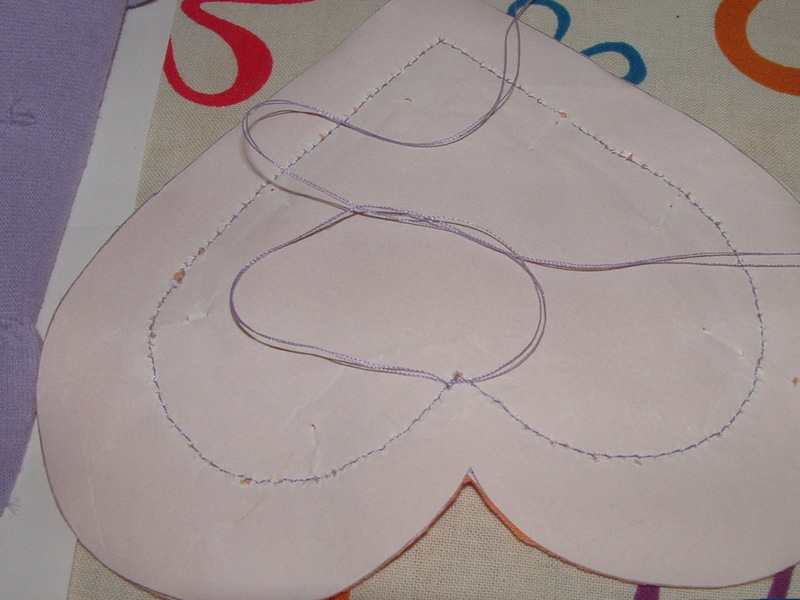 Carefully cut out the smaller hearts from the insides of the larger. 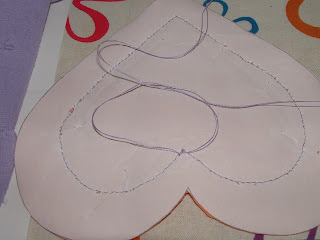 When you're done with this step, you should have solid heart shapes for the biggest and smallest hearts and hollow heart shapes for the middle two hearts. Iron your Heat'n Bond Lite adhesive side down, PAPER SIDE UP onto your fabric. 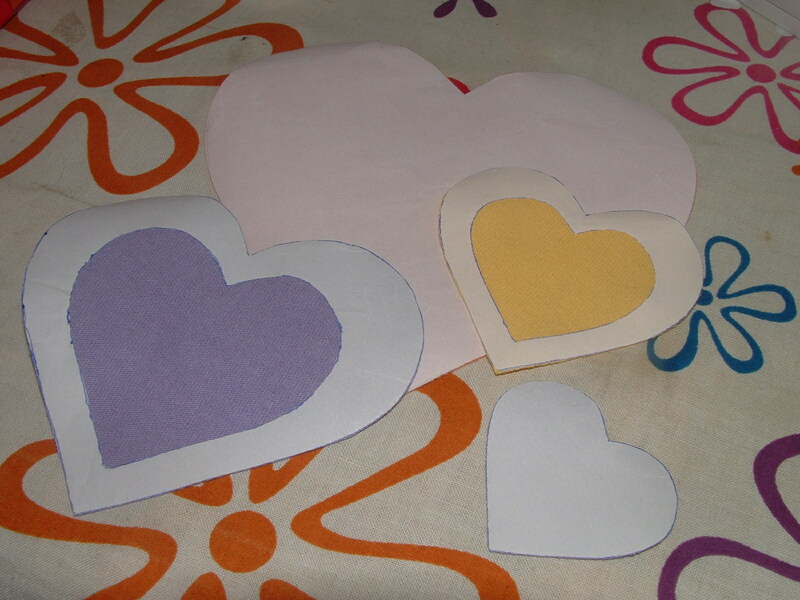 Peal, the paper backing off the three smaller hearts, but DO NOT take the paper backing off the largest heart yet. 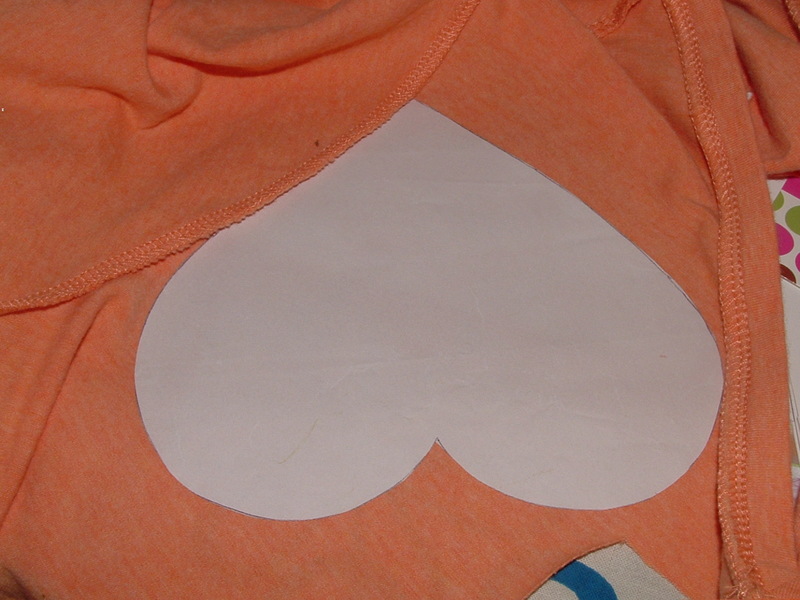 Arrange the three smaller hearts on top of the biggest one so they're evenly spaced. I would probably iron them one at a time, and then add the next layer. Iron well. Now you're ready to stitch. I used matching thread because I had it on hand. I wouldn't go out and buy new thread for a project like this. If you don't have matching thread, it can be decorative to use a different color. Since all the layers are securely stuck to each other at this point, it doesn't matter which layer you stitched first. 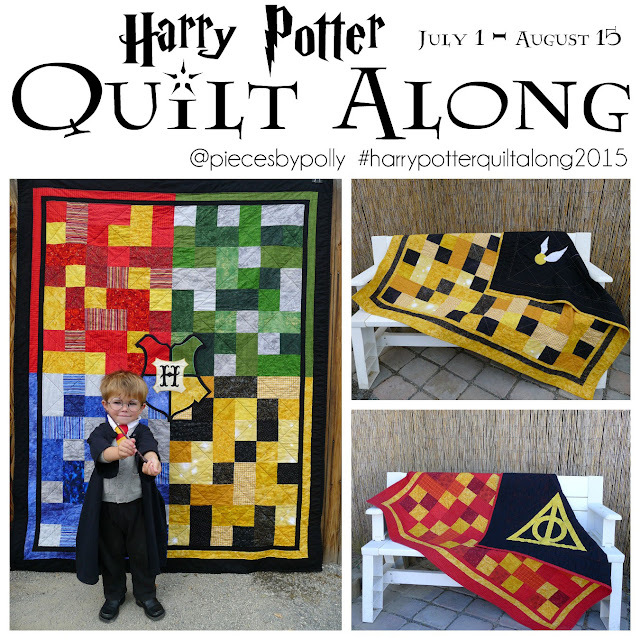 I think I started with yellow because there was already yellow thread in the matchine. 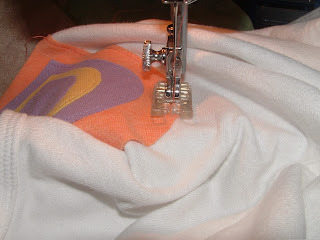 I do as much of the stitching on the applique as I can before putting the applique on the shirt. This way, there are as few threads as possible rubbing the skin through the shirt and less chance of the ends coming undone. Now you're ready to add your applique to your shirt. 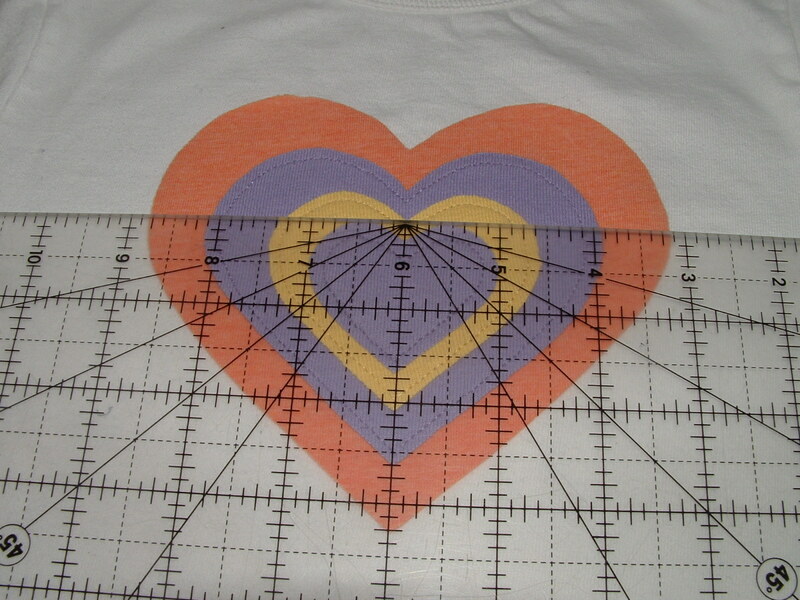 A word of caution...measure to double check you've got it centered. There's nothing worse than examining a finished project and realizing it's crooked. Once you're sure it's placed where you want it, iron it down well. Once you think it's stuck down well, iron it some more. Then when you're sure it's ironed really well, iron it through the inside of the shirt. You'd be surprised that there are still some places where it's not stuck well. (This is also why I always sew the edges instead of using the "no sew" stronger adhesives...I still don't trust that they're completely stuck on.) Then stitch onto your shirt. You want one of your own? 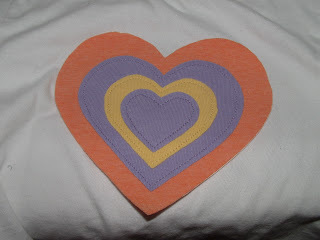 I'm giving away a duplicate applique on my blog, so come stop by! 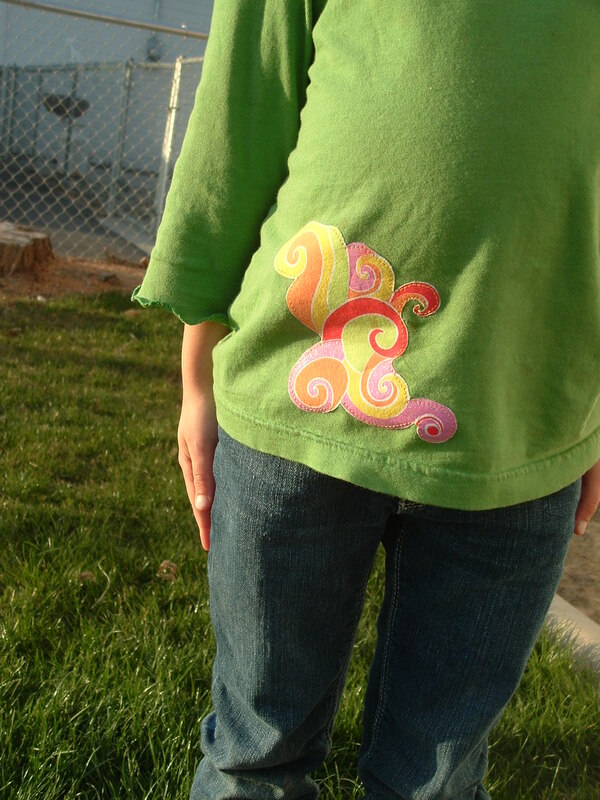 I copied the flower design from the shirt as appliques onto the capris. Pattern for appliques and tutorial for making these capris from a T-shirt coming soon on my blog. Here I made dinosaur appliques out of a too-small shirt and added them to a shirt and knee patches to make a complete outfit from jeans with holes in the knees and a thrift store red shirt. Click for the tutorial for the dinosaur applique and patches on my blog. 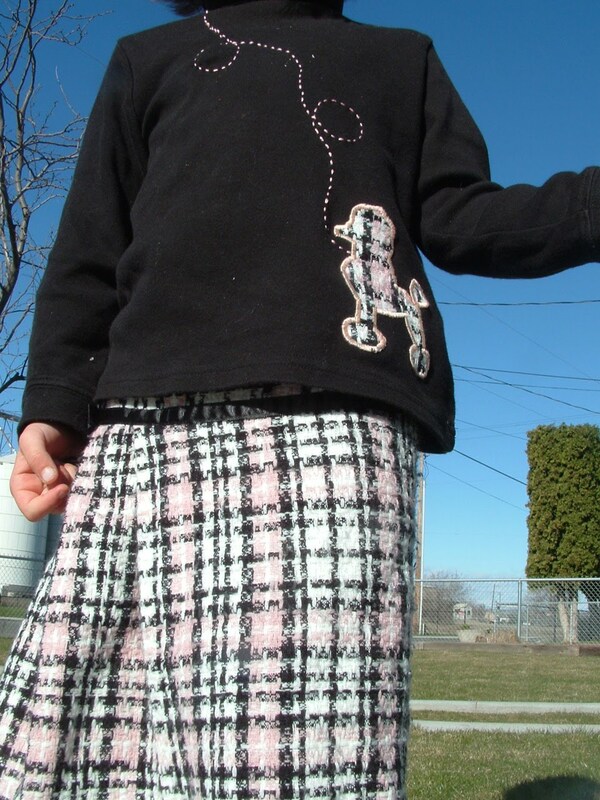 I used extra fabric from resizing this thrift store skirt to make the poodle applique for the shirt and then handstitched the leash. 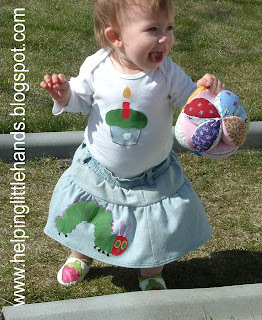 Here I recycled old jeans to make the skirt and used denim scraps in the cupcake applique as well as used the same green scraps from the Very Hungry Caterpillar applique to help them match. 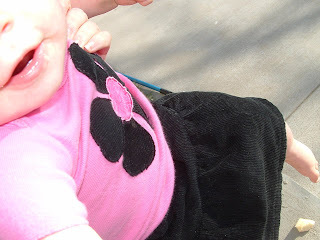 This black skirt was made from the same "pattern" as the denim skirt and I used scraps for the petals in the flower applique. 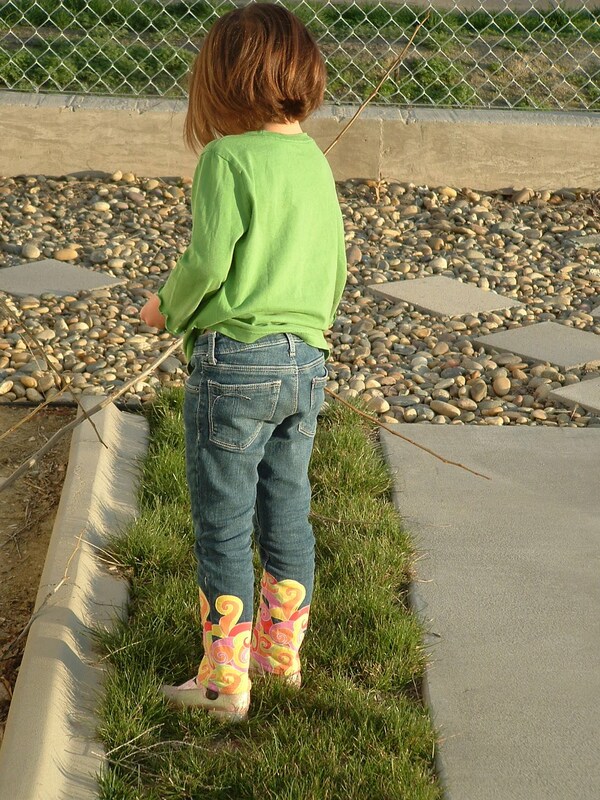 If you've found this helpful or inspiring, please stop by my blog soon for more ideas for Hand-Me-Down REHAB! This came out really cute! I love the instructions you gave!